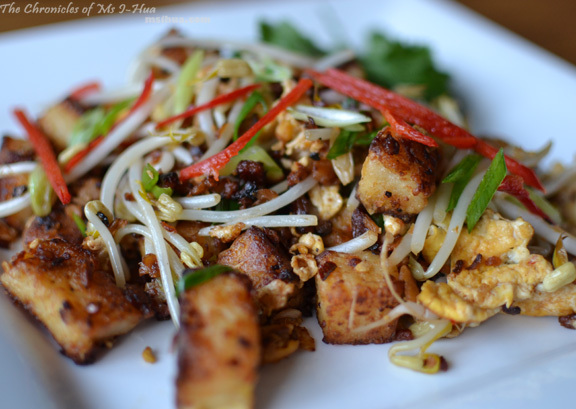 Chai Tow Kway is a traditional Teo Chew cuisine popular in South East Asia. In the local language, chai tow kway (or chai tau kueh) can directly be translated as fried carrot cake, though it has no carrots in it. 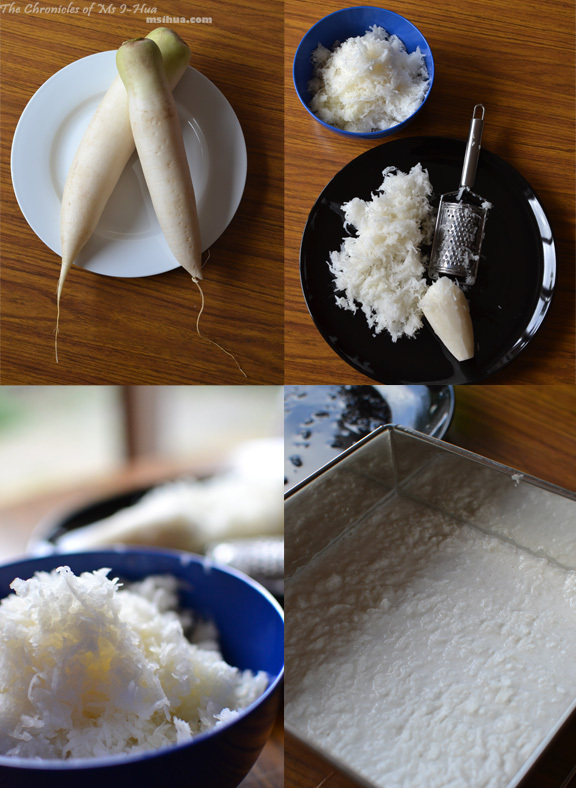 In fact, its core ingredient is the humble white radish or daikon. Things have changed since we first shared this recipe in 2010. Our culinary experiences have expanded and our palates have since grown. I hope that we never stop learning and improving our ways in the kitchen. It’s not often that we would choose to revisit a much loved recipe here on our blog. However as time passes, The Boy continues to tweak this popular street side (hawker stall) dish available at most Malaysian pasar malams (night markets) and Singaporean hawker stalls. This dish is also available at most dim sum (yum cha) places. The favourite part of The Boy cooking this meal for us is that I get to travel down memory lane with it. I am reminded of my childhood days of wandering the busy night market stalls on Saturday nights with Madam Mummy and Big Sis in search of our dinner. We would scour the streets just to find our favourite rojak stall, popiah vendor, chai tow kway uncle, ayam goreng (fried chicken) stall and other favourites. You can see how spoilt I was when it came to having a variety of good food to choose from. I am forever grateful to that exposure growing up. If I could go back now and speak to that 5 year old me, I’d say, “don’t bother playing with the carousel and slides at McDonald’s, go explore, inhale and eat all the things, as when you are much older you will regret that you didn’t enjoy it enough”! Add 3 tablespoons of water to the shredded radish. Steam radish in wok until it turns translucent. This should take about 25 – 30 mins on low flame. Take radish out and leave it aside to cool. To prepare the flour mixture, add a pinch of salt and sugar into the flour. Mix flour into 250ml of water. Stir the mixture thoroughly to remove any lumps. Combine the cooled radish with the flour mixture and mix thoroughly. Pour your final mixture into a cake tin and steam with a wok for 30 – 35 minutes over a medium-high flame. 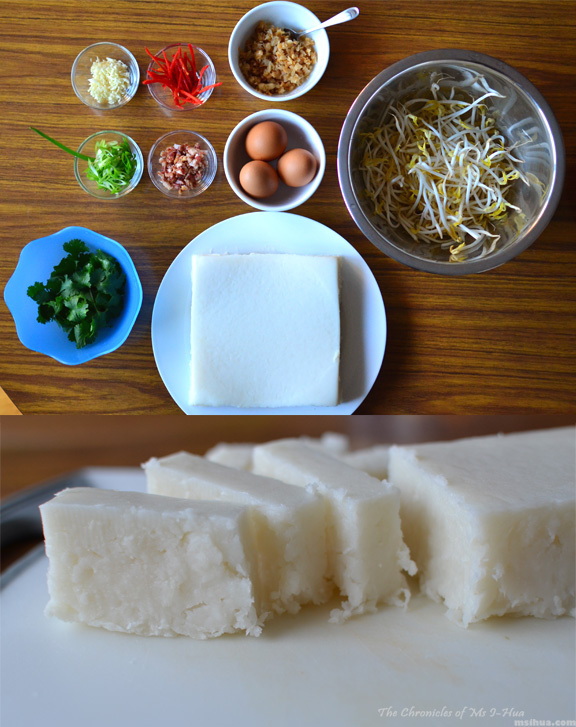 Take the radish cake out and leave it to cool for a few hours or overnight in a refrigerator. This will allow the cake to firm up. To stir fry, cut out 1 quarter of the radish cake and keep the rest in the refrigerator. Cut the quarter into smaller chunks. Heat peanut oil and shallot oil in a "seasoned" wok on medium-high heat. Add in your radish cake. Fry till the edges are brown and crispy-looking (if you prefer a crunchier texture on the outside, leave it to brown further). Add in garlic, lap cheong and preserved turnip. At this stage, you might find that the wok is a little dry. If that’s the case, add another teaspoon of oil. Fry till garlic is fragrant. Add the chilli paste. Stir ingredients and add the eggs in. Add the fish sauce and a dash of white pepper. Toss in the sliced red chillies and some spring onions. Fry till the egg cooks. 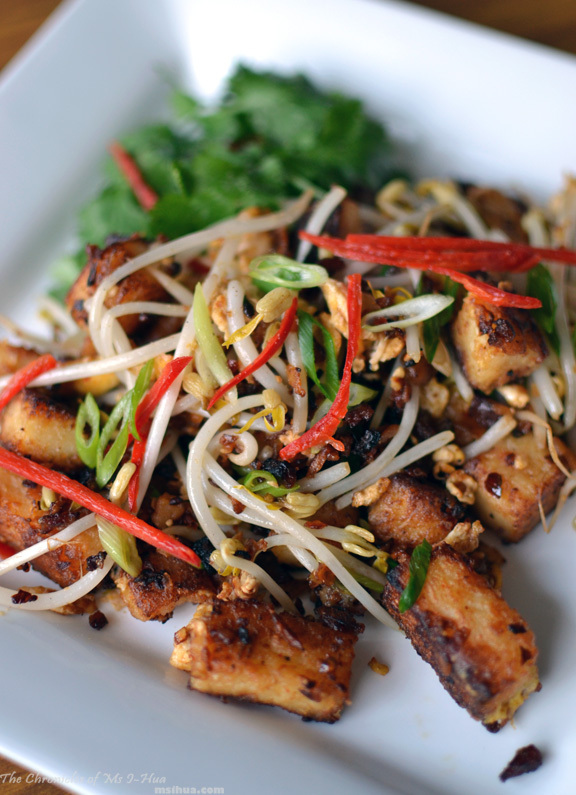 Add the remaining sliced spring onions and a handful of bean sprouts in and fry for a further 5-10 seconds. Turn the flame off. Give a quick stir before plating up. Try the "dark" version as well. Just add in Thick/Dark Soy Sauce (Cheong Chan Thick Caramel Sauce) at the same time as the fish sauce and white ground pepper. Adapted from Ms I-Hua's 2010 Recipe Post. Note: If you don’t have a “seasoned” wok, use a non-stick pan to prevent the radish cake from sticking onto the base when frying. You can also try the “dark” version. Just add in Thick/Dark Soy Sauce (Cheong Chan Thick Caramel Sauce) at the same time as the fish sauce and white ground pepper. I guess I am lucky after all to have married a pure Teo Chew boy 😛 We showed pictures of this dish once to my Po Po who exclaimed in delight that The Boy had gone to all the lengths to replicate this dish at home. What childhood dish would you like to recreate? 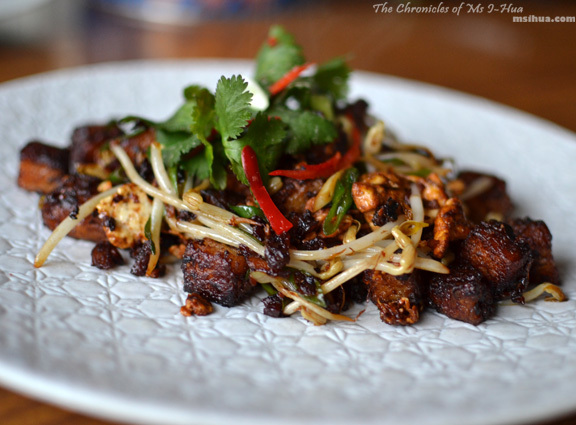 I loved eating this in Malaysia – and learning to make it at a cooking class – so good! It’s so rewarding making it your own too! i LOVE LOVE LOVE LOVE LOVE LOVE LOVE chai tow kuay! i used to eat it every saturday when i was a kid. always black, and always with chilli! Yah man! The best! I love the spicy spicy versions! Your home made version looks restaurant quality. I can see the crispy bits from the wok and wow, you’ve got my jaw dropping! It was crispy! I like mine with the extra burnt bits! You even made the radish cake from scratch. YOU TWO. Open your dang restaurant already so I can come eat for free. But then everyone would want to eat for free and then we’d go bankrupt! Omg this is FRIGGIN awesome I remembered going googoogaga when I saw you post a pik of this on Instagram. Didn’t realise how many steps there were to make a humble plate of Chai Tau Kweh. Makes me appreciate each plate even more when I order it at the hawker stall next time. Have saved this recipe for next time can’t wait to make it when I find more time in the weekend!! Hahah so cute la you.. googoogaga is something I haven’t heard in soooo long! Wow you guys even made the radish cake!!! 🙂 I don’t think I’ve had this before because this is different from CKT? Either way would love to try it!!! We are crazy this way 😛 It is similar to CKT, but that’s noodles, so the texture is completely different! ooh yummy! ive been craving malaysian food lately, this made me drool! I wonder if it’s GF? Should be as it’s radish! One of my favourite pasar malam snack! I always tell the uncle “Uncle, fry until black black please and don’t put tao geh ah!” 😛 Aaron’s one really does look super good. Would look to attempt cooking this at home one day. Y U NO LIKE TAUGEH?! I love it with more taugeh! Unless tapau then maybe that would end up being too soggy? Yummy! It’s a little tedious to make but so delicious. I personally prefer the dark version, back in the days this dish is so special because there’s only one lady in Bintulu (one!) who does good one but then we stopped buying it because we spotted her korek-ing her feet when she had some freetime… eekkk! The ones in Singapore are really good though. Hahah always news to first timers.. no carrot? But why call it a carrot cake? Why??! Because the radish is called white (bai) carrot (luo bo) in mandarin, so luo bo gao gets translated to carrot cake. Lost in translation. Sodesne.. I didn’t know that as I don’t speak mandarin 🙂 Thanks! Hahah so many of you TC people out there! Stumbled on this from google. I have an immense love for the white version of this… now to get over the fear and tackle this recipe. Wuhoo! Go forth and replicate! Hello, I need some tips from you. I tried making it according to your instruction but when I stir-fry the “kway”, it became soft and mushy. What did I do wrong?